Disconnect a cluster from monitoring within OpsCenter and managing within Lifecycle Manager. Disconnecting a cluster from OpsCenter does not delete the cluster itself. Add an existing DataStax Enterprise cluster to manage using OpsCenter Monitoring. Install agents on the cluster nodes automatically. Disconnect a cluster from monitoring within OpsCenter and managing within Lifecycle Manager (LCM). Disconnecting a cluster from OpsCenter does not delete the cluster itself. Disconnecting a cluster also removes the cluster, its datacenters, and nodes from management within LCM. The cluster can be reconnected for OpsCenter monitoring, and the cluster topology reimported into LCM at any time. From the OpsCenter Monitoring main menu, click Settings > Cluster Connections. The Edit Cluster Connections Settings dialog appears. 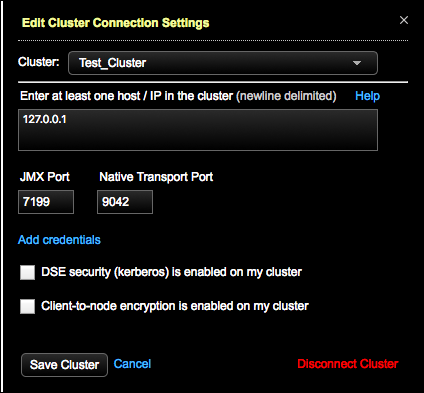 Select the cluster to disconnect from the Cluster list. A prompt requests confirming the disconnection. Click Disconnect to confirm disconnecting the cluster from monitoring within OpsCenter. The cluster, its datacenters, and nodes are also removed from management within Lifecycle Manager.